Our friends Dan and Cynthia have been members of Peju for over 20 years. They like to bring us to visit the winery when we’re in the valley attending the Insignia Day event. We enjoy the tasting with the Wine Singer “The Yodelmeister”. If you have not seen Alan he is worth a visit! I recently had a dinner meeting with a vendor/gentleman who lives in San Diego. He has a sister who lives in downtown Napa. As we talked about Napa the first thing he brought up was Alan at Peju. I immediately knew who he was talking about. Alan conducts a pretty cool tasting and incorporates Rap, guitar playing and other types of music and entertainment into his tasting. 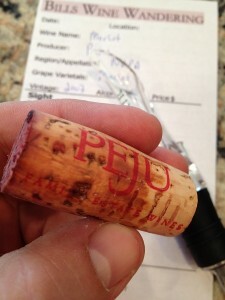 During our last tasting at Peju Chris favored the the Syrah and Merlot. She decided to order a mixed case to be shipped. Fortunately, we were able to utilize our friends discount! 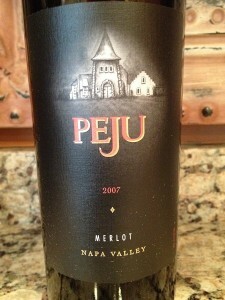 After our return from Napa our case of Peju showed up. It was a Sunday night and we decided to give the Paju Merlot a try. During the original tasting at the winery Chris remembered the spicy notes and enjoy it a lot. When I pulled the first cork I have to admit I was concerned. As you can see the Merlot has creep-ed its way towards the end of the cork. It’s a 2007 so I feel the cork should look better. Well I figured we have nothing to lose so I poured the Merlot into our glasses. I could see it was still good! I was very pleased. It was time to review the Merlot. The color depth was pale and you could see a deep Garnet color. It was very clear with no sediment. 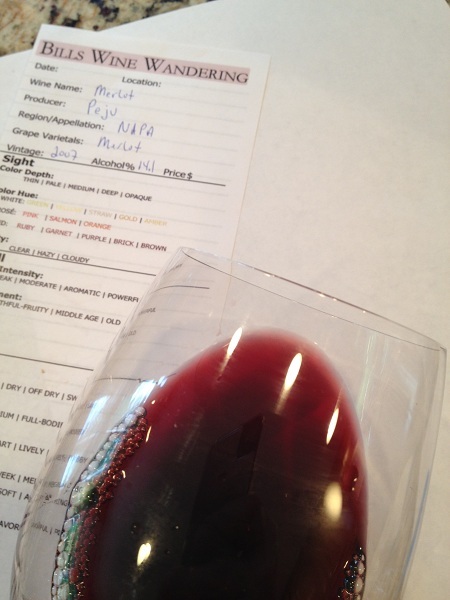 As we smelled the Merlot it did smell like it was aging well. Some of the aromas were Cherry, Liquorice and maybe a little Cinnamon. It was time to taste the wine. Tasting the Merlot it was slightly dry and it was medium bodied. There were still tannins which were felt from the front of my tongue and worked its way to the middle. The Merlot was still flavorful with a medium length finish. Some of the flavors were Cherry and Spice. This wine was holding its own. 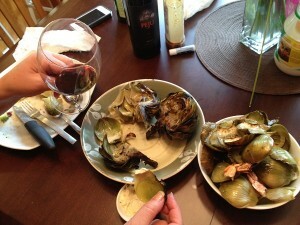 We decided to pair the Merlot with some grilled Artichoke hearts. The Artichoke and Merlot complimented each other. What a great start to dinner. We rated the 2007 Peju Merlot three glasses.